Naked Floors makes handsome wood floors for some of the finest homes and most exclusive places of business in the British Isles. We hand craft every consignment to order in our artisan workshop in Sussex. We’ve been in business since 2002. 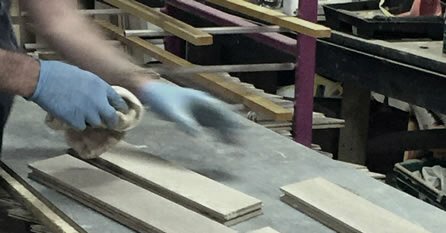 The Naked Floors story begins with master craftsman, Nick Bounds. Nick discovered his love for wood as a young boy. 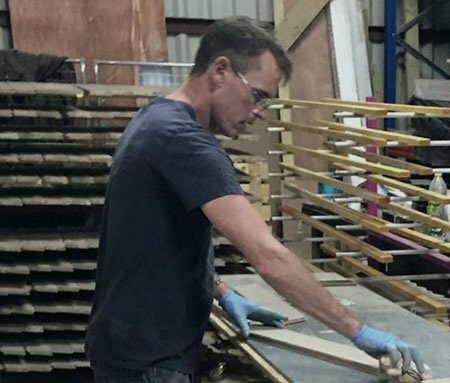 He grew up helping his father reclaim timber and his mother restore antique furniture. Endless hours’ spent sanding and applying natural oils forged deep emotional bonds with the wood he’s been working ever since he was old enough to help. Setting up Naked Floors in 2002, he established a niche in prestige architectural projects and period restorations; jobs where the primary needs were quality and craftsmanship. Along the way Nick teamed up with fellow master craftsman, Ashly Burke, to help expand. One of the problems that cropped up repeatedly for us as installers was the quality of floorboards available from the major suppliers. To this day, most floorboards on the market are mass produced from high volume factories in the Far East. Even where the structural quality of the wood is good, much of it is so perfectly uniform that it lacks character and looks a lot like synthetic laminate. For that reason many clients liked the idea of using reclaimed floorboards for character instead of new wood. Unfortunately using reclaimed floorboards has its own problems. For one thing, quality reclaimed wood is very hard to source in sufficient volume for all but small projects. It’s expensive too. For another, solid floor timbers and blocks, especially old ones, don’t suit modern living conditions, even in old buildings. They’re simply not able to withstand the indoor climate conditions created by our modern insulation and heating systems. They shrink, expand, warp and split. Moreover, even the best preserved wood gradually becomes porous and brittle with age. As such, a lot of reclaimed flooring, which is old wood (sometimes 150 years old or more), offers a very limited lifespan compared to new wood. It was this lack of supply of character grade premium floorboards that prompted us to start making our own floors. We produced our first batch for a client doing an 18th century barn conversion. She wanted floorboards that looked the part - matching the age and character of the building. Sourcing the right width and quality for the project proved impossible, so we offered to make repro’ reclaimed floorboards instead. The client was beyond thrilled with the hand distressed oak floorboards we produced to her exact colour specification. And because they were engineered rather than solid timber, they were structurally superior and more stable, guaranteeing many years more life. 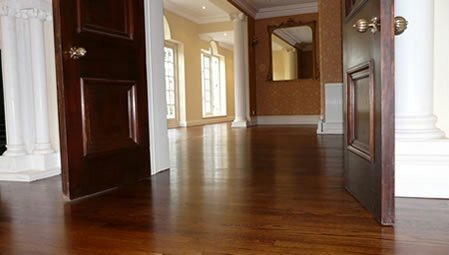 It soon became clear there was good demand for character grade floorboards for prestige architectural builds and period restorations. And since then we’ve shifted our focus almost entirely to floorboard production. Graduating to production after so much experience ‘on the tools’ has proved invaluable when it comes to understanding customer and installer needs too. We have years of first hand installation and restoration experience. As such, we understand what it takes to satisfy the highest levels of customer expectation. The many beautiful buildings we’ve supplied include stately homes and other listed buildings, high end retailers, professional offices and studios and a growing number of gastro pubs. We’re continually experimenting with new colours and finishes and currently offer a range of 1500 colours, a small selection of which you can see in our product gallery. Do you have a flooring project in mind? If you don’t see what you need on our product pages just send us an email. We can colour match and offer a wide range of sizes. We guarantee you’ll love your floorboards — custom made by Naked Floors!